A memorial service may be somewhat similar with a funeral service, but the biggest difference is that in a funeral service, the body of the deceased is present, but in a memorial service, the body is not present. For both services, close friends and family members are requested to attend. It is also important that the memorial service will have to be organized ahead of time and set a date where everybody will be able to attend. Usually, the memorial service is held during anniversary of death or during the birthday of the deceased person. If you are trying to organize a memorial service, refer below for the guideline. Just think of the memorial service as some kind of a party honoring the life of the deceased person. And because you are honoring the life of a person, preparing a speech dedicated to the deceased is necessary. So several days before the funeral service, you have to inform the people that you want to deliver speeches honoring the life of the departed one. Aside from speech, they can also recite a poem dedicated to the deceased or perhaps sing a song. When looking for a person to deliver the speech, make sure that you choose someone who is very much close to the deceased or someone who knows him or her very well. Music is one of the most important aspects of a funeral service. It gives life to the service, because as you know, music is a language of emotion. It affects people profoundly even if we are not familiar with the song. 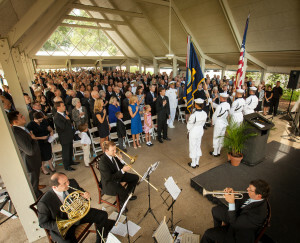 Since music is a vital part of a memorial service, make sure that you choose the music well. It should be something related to the deceased or perhaps something that can help to provide comfort to the bereaved friends and family and brings in memories of the deceased person. A religious funeral service may use religious songs as well. You can also choose to play the favorite songs of the deceased. Sometimes, funeral homes have an excellent sound system so you may want to check with them. If you cannot think of any music to play at the memorial service, you can ask the funeral director for advice. It is also a good idea to add some variety and some sort of uniqueness on the memorial service. Here are some great ideas. Balloon release – a good idea is to have the guests to write a note for the dearly departed in a piece of paper and then tie it on the string of a balloon to be released right at the end of the memorial service. Dove release – the dove is a symbol of peace and is also a great way to commemorate the important milestone of a person’s life. It also represents the soul’s final journey. Another great idea for the memorial service is the releasing of dove right at the end of the service. Remember that you will need to distribute a funeral program template to your guests guests. To help you on this, you can make use of the free templates for memorial service online.